You must be a member of the London Eastern Europe Group to attend this activity. Would you like to join this group? Let's visit theProtected content and take one of their free tour showing off the highlights of the gallery. 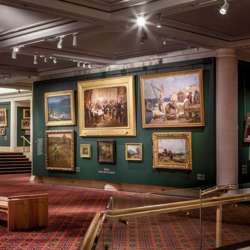 A rich variety of Victorian paintings can be seen as you enter the Gallery, displayed in original 19th century style. The collections illustrate the key artistic movements and influences of the Victorian period, from the Pre-Raphaelite Brotherhood, to Orientalism, Classicism and narrative painting.